I sleep very well, and then I have another shower. It just feels so good. Breakfast tastes good too. I have organized all my belongings, one big duffel bag full of stuff I don't anticipate needing any more (warm fleece clothing, ice axe, crampons, hiking boots etc.) 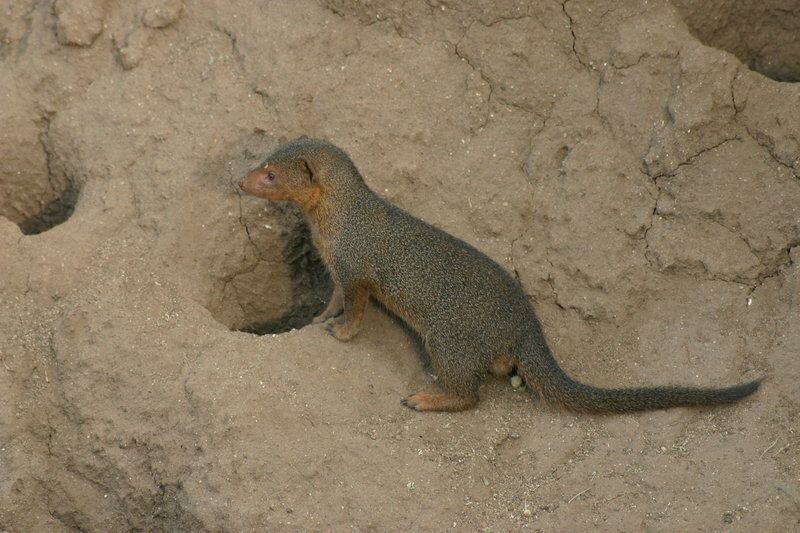 and one of stuff I'll want on safari. 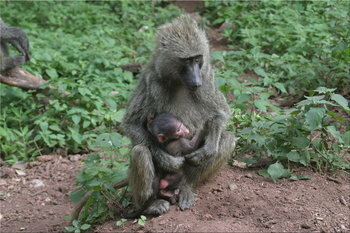 Both will come with us though, because at the end of the safari we will be directly dropped off at Arusha airport. We are checked out of the hotel and ready to go by 9:30AM. Our pickup is late though. Andrew is surfing Expedia and another travel site on the hotel's internet access machines, looking for a better deal on air travel. Not only does he not find a better deal, he finds no flights at all. 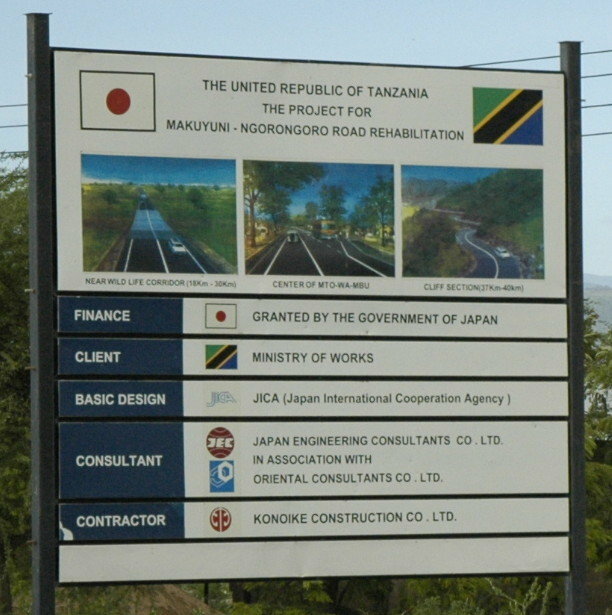 The reason may be that most of them go to Kilimanjaro International Airport, and not Arusha Airport. So Peter attempts to pay for the tickets using a credit card. This is rejected and so are the other cards we have on hand (Visa, Mastercard, Amex). There is absolutely no way to pay for these tickets except to go to a cash machine in downtown Moshi, withdraw cash using our bank cards, and then go to the Zara office and pay in person. Our ride comes. The vehicles are a Land Rover "Defender" driven by Robinson, and a Toyota Land Cruiser of similar size driven by Issa. Our cook's name is David. Vinh (whom I met yesterday) has been added to our safari party. A couple of other Americans are also riding along but will be going their separate way later today. All our bags are strapped onto the roofs of the vehicles as usual. I notice that the vehicles have two-way radios. We will learn that they have a private Zara frequency and that the radios have a usable range of about 150 kilometres. We stop at the Zara headquarters where a trailer is attached to the land rover and then into town, where we drive around quite a bit before we all converge on the bank downtown. The bank has several serious looking (but as usual unarmed) security guards watching from across the road, and another in the lobby. It is air conditioned and just like any bank back home. The cash machine will only dispense Tanzanian shillings and the largest denomination is a Tsh 5000 bill, i.e. worth US $5 or so (the official exchange rate is around 1050, the unofficial one used in the street is 1000). The machine also has a per-transaction limit of Tsh 200,000 and of course there are cash limits on our accounts. And Andrew's card is rejected. What this means is that between the lot of us we barely come up with enough shillings (in 1/4" thick wads; I should have gotten a photo) to combine with almost all our remaining US dollars to pay for everyone's ticket. It takes a lot of time and nerves fray a little before the tickets are finally bought and we are on our way westward towards Arusha. I remark on a team of painters repainting the dashed line on the road by hand, with paint brushes. Other work men direct the traffic around them. As you often see here, the part of the road where cars are not to go is blocked with big stones scattered on it. I also see the world's simplest telephone cell site: Just a pole with the usual antenna on top, a wire dish antenna to connect it to its base somewhere, and an electronics box bolted onto the pole. The Toyota has gone ahead but we pass it in Arusha. We meet at a big curio shop emporium just past that city and boxed lunches, very similar in composition to the packed lunches we got on the mountain, are handed out. To go with them, I buy some "Mirinda" brand soft drinks, a Pepsi product that I don't see anywhere else (Coca Cola rules as supreme as Toyota in these parts). Andrew has a hankerin' for potato chips. But these are a rarity here. I go across the street to a well-stocked snack shop by a gas station and they have cookies and candy of every kind but no potato chips. An American from another safari tour who is also stopped for lunch waves an unlabeled clear plastic bag of potato chips that he bought earlier in the day for $3 and offers to resell it, but Andrew declines. 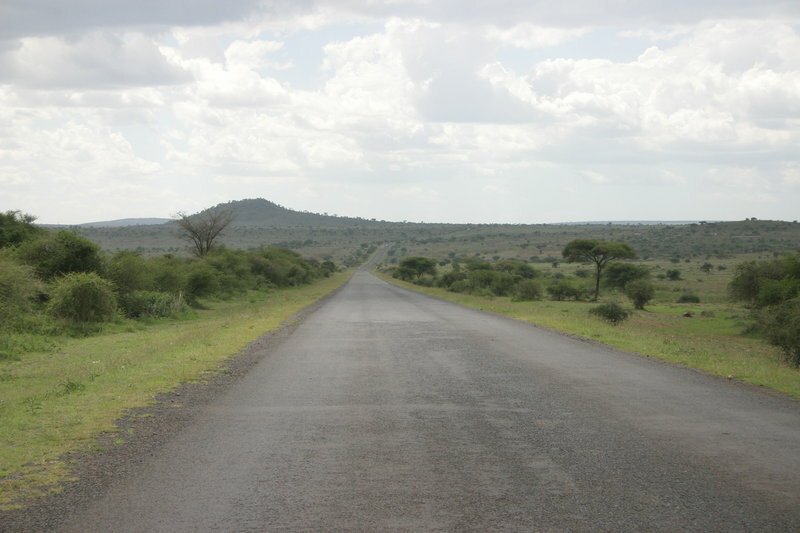 As we drive on, we soon turn right onto the road that goes up to Ngorongoro Crater. It is newly paved and in perfect condition. This sign photographed by Pu explains why such a nice road is here, in a relatively low-traffic corridor. 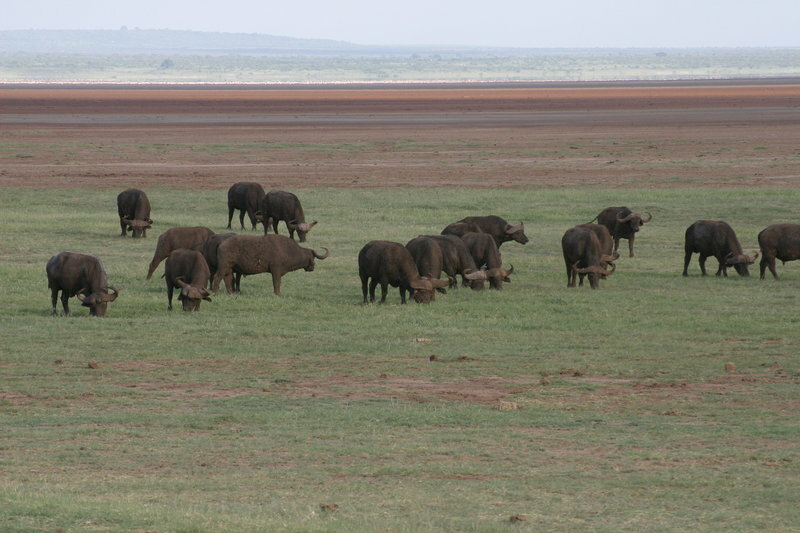 We are in Masai country. As far as the eye can see, only open pasture, with herds of livestock each tended to by a colourfully robed herder. Sometimes the herders are children. Villages of mud huts, and sometimes more modern buildings, are visible in the countryside. Robinson explains that the Masai do not like to be photographed (except by prior agreement and with payment) so if one does it, please only from a fast-moving vehicle because otherwise they may throw rocks at the car. Also, we pass a military base, where photography is forbidden. I notice that part of the barbed wire perimeter fence of the compound is missing; only the concrete poles are there. We get into a small town, and stop at the Twiga Campsite. I had a mental image of roughing it on this safari, of being camped in open grassland with wildlife all around, but tonight at least we are in an European style campground. It has washrooms, showers, cottages for those who do not wish to camp, a cook house, roofed areas for eating, and a swimming pool and bar. 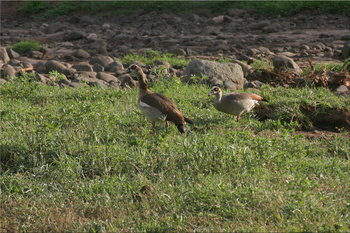 It also has a perimeter fence and a gate which is locked at night. 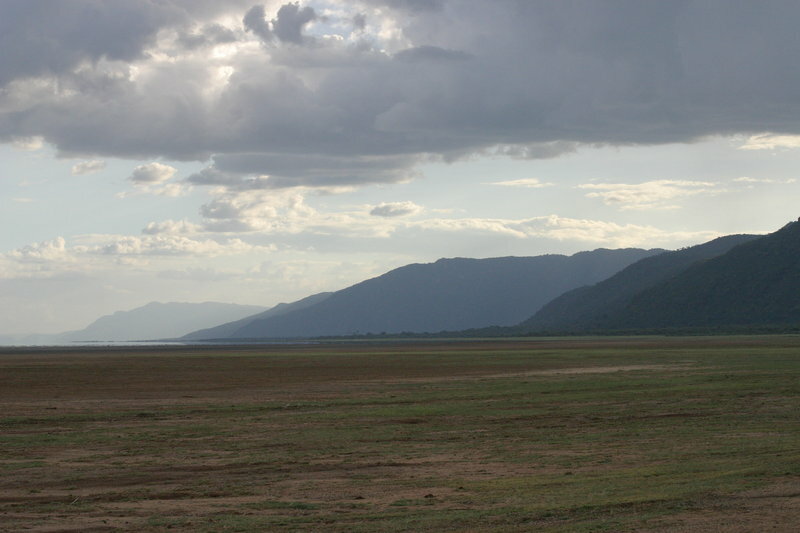 We don't see all this right away though, because we just unload all the bags, the trailer and David the cook, and immediately proceed into nearby Lake Manyara National Park to spend the approximately two hours of sunlight that remain, watching animals. Lake Manyara National Park is a strip of land between the lake, and an escarpment that separates the flat park from the hilly terrain of the Great Rift which formed when a crack in the tectonic plate nearly split Africa in two, about 35 million years ago. The park has a variety of terrain and vegetation, from open grassland, to marsh, to dense jungle. 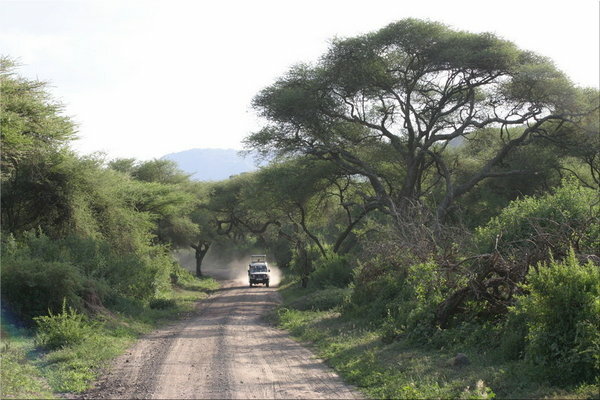 It is criss-crossed by a network of dirt roads, most of them good enough for an ordinary automobile, but with a few water crossings worthy of a land rover type vehicle. 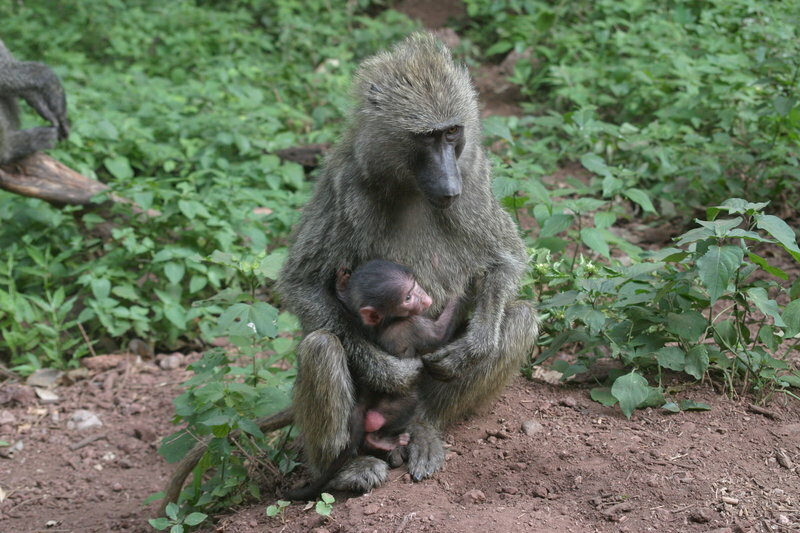 Almost immediately after entering the park and waiting for Robinson to complete some paperwork at the ranger station, we encounter our first (to us) exotic animals: Baboons. The engine is shut off and the cameras click away as the monkeys go about their antics. A little down the road, we see our first elephant, a small one (Robinson estimates 12 years old). Then another elephant, and then giraffes. 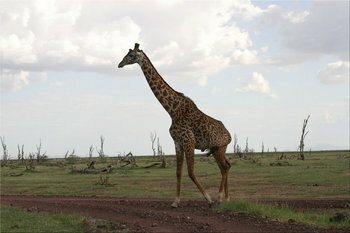 We have by now left the woods and are out in an open plain (with other safari vehicles driving around in the distance). The giraffes standing about prompt Andrew to say that this must be where George Lucas got some of his visual inspiration. Next, a male velvet monkey with the bright blue balls of that species (prompting some juvenile jokes you can imagine for yourself). 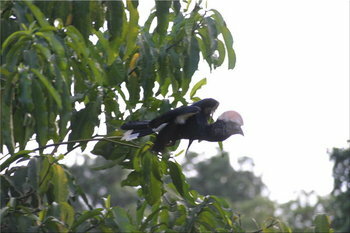 Then we spot several very strange looking birds which turn out to be silvery-cheeked hornbills. 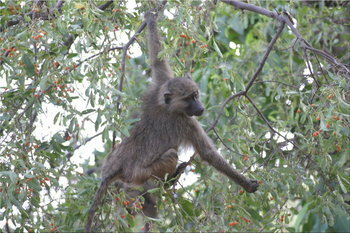 Then more baboons, a whole colony of them sitting on both sides of the road. 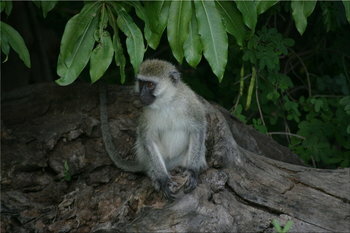 Several of the monkeys seem to be having an acrimonious argument. A bunch of others are up in a tree, skillfully using their four equally dexterous limbs to pick berries. The evening sunlight is beautiful, and so are the woods and open plains. We see a shimmering pink line on the horizon at the lake. We are told that these are all pink flamingoes. This seems hard to believe until a cloud of them obligingly flies up before settling back down. Pink flamingoes get their characteristic colour from their food, which is the brine shrimp that are easy pickings at the edges of shallow, saline lakes like this one. 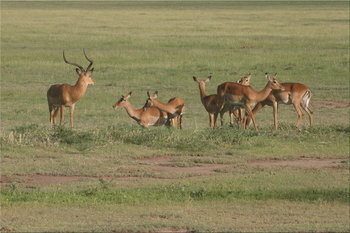 A herd of impalas is encountered next. 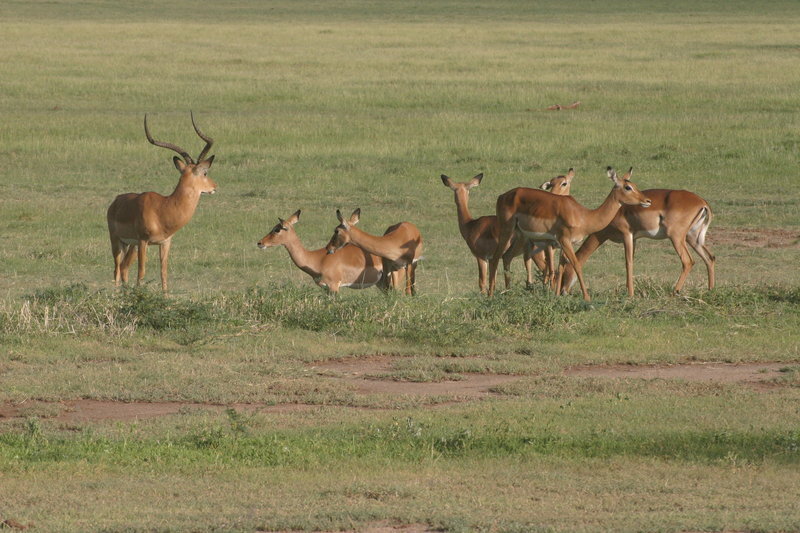 These are sleek, deer-like animals, with big horns on the males and none of the females. 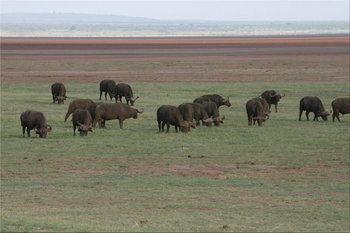 A given male has a whole herd of females. These creatures are totally unlike the heavy, cumbersome Chevrolet Impala automobile. 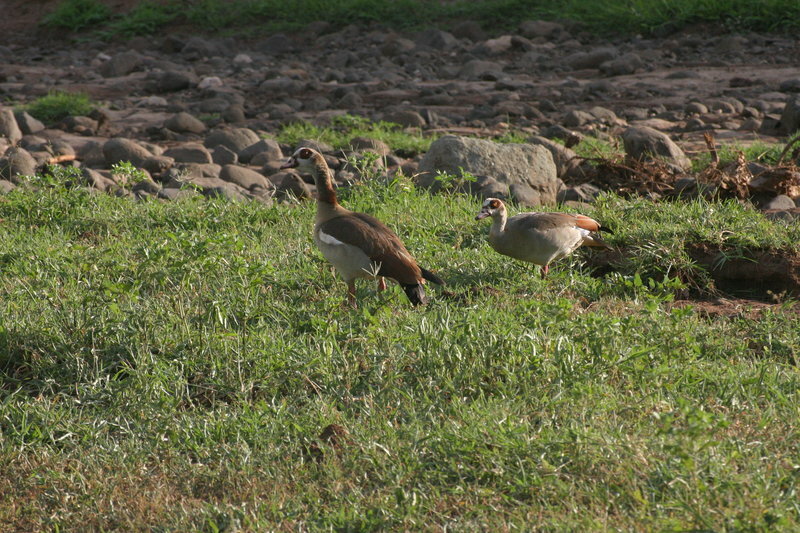 We also see a herd of water buffalo, and at the other end of the size spectrum, some Egyptian geese (which I first assume are ducks) and a dwarf mongoose colony, which rises out of the ground like a termite castle. All these animals, from the largest to the smallest, don't pay the noisy diesel powered safari vehicles the slightest heed. I am guessing they have lived their entire lives with this traffic, and classify it in the same category as an elephant: Big, can't eat it, doesn't try to eat you and there's nothing you can do about it, so you might as well ignore it. 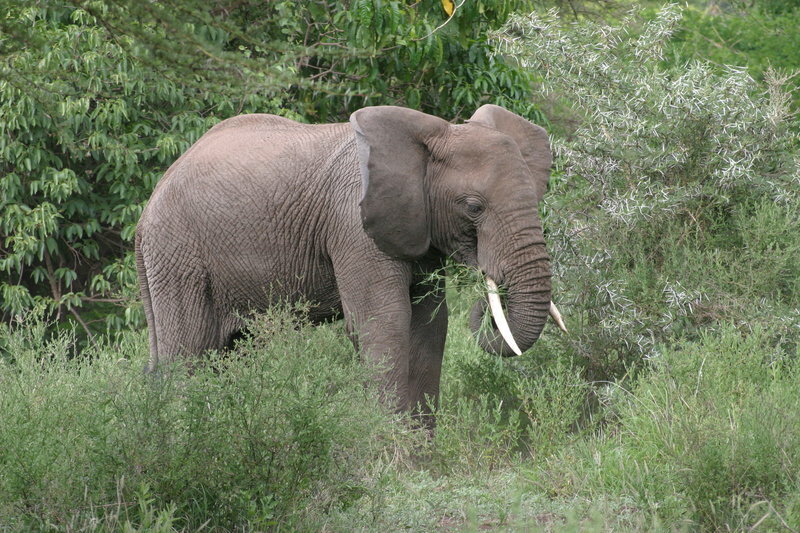 This goes for the elephants themselves too: They could easily chase off something the size of a land rover if they wanted to, but they don't seem at all bothered by us. I find the safari vehicles as photogenic as anything here, and photograph them as well. Pu is ecstatic about the woods. The weather is beautiful, and as usual there are no mosquitoes to speak of. Up to now, we have done pretty well with our digital camera storage. We have enough memory for about 1000 pictures each, but now, in two hours we've fired off about 200 and some serious editing is in order. Fortunately the batteries on the digital SLRs last a long time. The cheap 55-200mm zoom lens that I've bought (equivalent to 90-320mm on a 35mm film camera) is working out very well, except that I'm having to set the camera to ISO 400 and thus getting slightly grainy pictures. Thanks go to Caroline for remembering what all the animals are called and helping me (three weeks later) correctly caption the photos in this trip report. Note that there are a huge number of animal photos on each of the safari days, all of which you can see by following the "All pictures" links at the bottom of each page. Just before the sun goes down, we head back to the campground. Not only is this like a European campground, but the couple at the table next to ours with Courtney and Julia (who keep crossing our path) are Germans. It is the girl's birthday, and there is enough cake for all of us to get some. There seem to be a lot of other Germans camped here too. Dinner is excellent. I make several trips to the grocery store just outside the campground gate to get soda pop. We sit around talking until long after dark, me in German with the German couple after the others wander off. Eventually I follow some intriguing drumming noises and find the campground's bar, where a trio of percussionists are making a compelling noise with a mostly white audience watching in respectful silence. I do a little bootleg recording with my digital recorder in plain sight. Nobody pays it the slightest heed, since small, shiny tech gadgets being fiddled with and sitting on a chair armrest are usually cell phones. A group of men and women who have been sitting in front of the building now come in, and they turn out to be dancers. Really good dancers. I watch what remains of the show, and it is excellent. For the final number, the dancers all drag audience members onto the dance floor. I resist. When it is finished, I withdraw into the land rover with the recorder to take some notes away from mosquitoes, and then go to bed. It is quite hot all night and I don't sleep well.